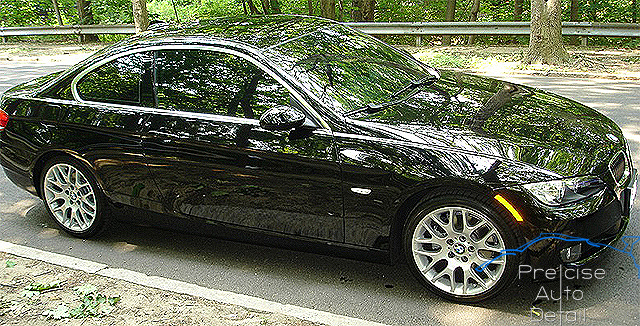 Precise Auto Detail currently offers one series of window film for vehicles. We can order and install ceramic films by request. Our tint will not only add style and privacy to your vehicle, but will also not interfere with signals, such as GPS or cell phones. Our tint will not peel, bubble, or delaminate after average curing time. We have three tint shades to choose from: 35% 20% and 5%. If you need a different percentage, please let us know. Scratches or rips in the film is the customer's responsibility. Quality tint on your windows protects not only your eyes, but also your skin from the damaging effects of direct sunlight. Placing a small strip of tint (visor) at the top of the front windshield has been proven to reduce accidents due to driver visibility problems. Depending on the tinting material, it can reflect UV rays, which will protect your cars' interior surfaces, especially leather from fading and cracking damage. It can also reflect Infrared rays (Nano Ceramic), which will reduce heat buildup inside your automobile. Tinting can add considerably to the aesthetic quality of an automobile; visibly increasing its overall value. 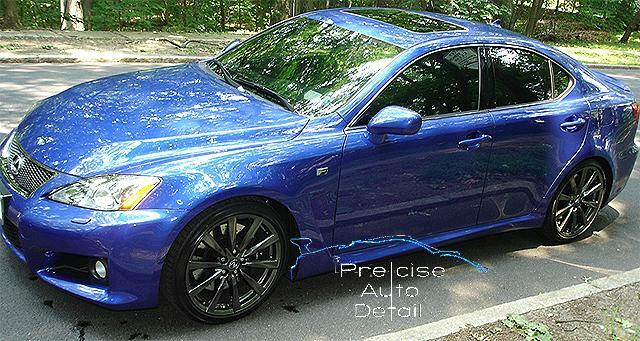 Precise Auto Detail also provides Residential & Commercial Window Tinting for Houses and Buildings through-out the whole tri-state area. You can use our clear bra on the exterior of your car to protect it from rocks, stone chips, scratches, bugs, birds, grease, salt, water, road debris, etc. Want to change the color of your car, add pin stripes, designs, or even flames without having to do an expensive repaint? We do it, using our state of the art vinyl wraps with Air Channel Technology. Our vinyl wraps will transform anything you want into a stylish look without spending the custom paint price. Vinyl your hood, rear trunk, spoiler, lips, side pillar bars, rims, side mirrors, door handles, windshield, interior trim, etc. All of our films are extremely durable and will protect your car's paint from rust, rock chips, minor scratches and UV rays. Call or email us today for an estimate to clear bra/vinyl your whole car, or certain areas (mirrors, bumpers, hood, fenders, door handle inserts, etc). © Precise Auto Detail - All rights reserved. 2019.